Here’s something I couldn’t help but to compare. 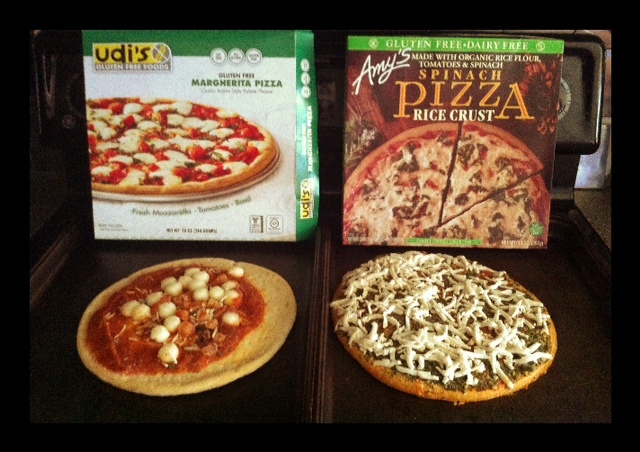 My dairy GF pizza from Udi’s on the left, and the Amy’s GF/DF pizza on the right. I think my 4-year-old had it right with the Udi’s pizza… “That looks yucky!” My 12-year-old said it did taste good, however. But come on. Sometimes it’s difficult not to. Their genes, their environment, and their experiences all add in to mold their personality. The saying, “don’t judge until you walk a day into someone’s shoes…” Can’t really apply – because there were MANY days before they got to that walk, of that one day. Simply said – you cannot take a snap shot of one day, or one situation – and compare things, and expect to have an understanding. When it comes to my children – I simply try to love them – each for who God made them to be… but I’d be lying if I didn’t sometimes wish they each had a bit of eachother’s “best side”. Similarly with my friends and family, I can’t expect them all to act the same… or believe everything the same as me, have the same convictions, opinions and understanding. We’re DIFFERENT. With different blessings and challenges – according to what brings God the most glory. Sometimes we like to think our spouse should be more like us, and yet – if they were… that wouldn’t be a good fit either. There is a reason God made us ALL different. IT’s with a great purpose. sanctification. We learn to get along with different personalities, how to relate to people who have different challenges than we do… and it allows us (hopefully) not to be so self focused. There is a world of people hurting around us. How do we reach those people for God’s glory? Being able to relate, sympathize, and empathize. Let your life be a witness for His glory. In struggle and in blessings. Because really, they’re one in the same… and the struggles keep us closer to God. Thankful for that blessing. Posted on September 5, 2012, in Celiac/Gluten Sensitivity, Food To Try, Our Struggles and tagged Amy's pizza, celiac disease, gluten intolerance, healthy for him, lactose intolerance, Udi's pizza. Bookmark the permalink. Leave a comment.